"Nanling" redirects here. For the county in Anhui, see Nanling County. Not to be confused with Wuling Mountains. 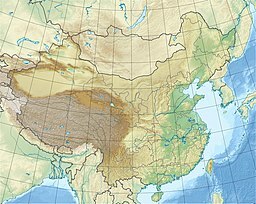 The Nanling (Chinese: 南岭; pinyin: Nánlǐng; literally: 'Southern Mountains'), also known as the Wuling (Chinese: 五岭; pinyin: Wǔlǐng; literally: 'Five Mountains'), is a major mountain range in Southern China that separates the Pearl River Basin from the Yangtze Valley and serves as the dividing line between south and central subtropical zones. The main range of Nanling Mountains stretch west to east about 600 kilometers (370 mi) from Guilin and Hezhou of the eastern Guangxi to Ganzhou of the southern Jiangxi, north to south about 200 kilometres (120 mi) from Yongzhou and Chenzhou of the southern Hunan to Qingyuan and Shaoguan of the northern Guangdong; With its branches, the whole mountains run west to east 1,400 kilometers (870 mi). There are trough basins in the Nanling, the most of the western basins in Nanling Mountains are composed of limestone, where karst regions are located. the most of the eastern basins are made up of red sandstone, where are danxia landform areas. The Nanling are boundaries between the four provinces of Guangdong, Guangxi, Hunan and Jiangxi, and also the cultural boundaries, on the south of the mountains are Lingnan culture area. The Nanling is a corridor where Chinese ethnic groups migrate and also the land of national amalgamation. In the Nanling, there form trough corridors, tectonic fault basins or watersheds, where are relatively low and not difficult to climb, between the natural gorge channels and the river systems in the north and south of the Nanling are natural channels, people-to-people exchanges are easy. Since the Qin dynasty, from the Central Plains into Lingnan (the south of the Nanling) there have been five ancient roads, which are YuechengLing Road(越城岭道), Mengzhuling Road (萌渚岭道), Qitianling Road (骑田岭道), Lingling-Guiyang Path (零陵桂阳峤道) and Dayuling Road (大庾岭道). At the same time, many tributaries of the Yangtze system and Pearl River system have also formed west to east passages. The mountains forming the ranges are generally of moderate altitude, the highest point being the summit of Kitten Mountain at 2,142 meters (7,028 ft). Dayu Mountains (大庾嶺), including Baiyun Mountain. The Nanling Mountains separate Central China from South China. Areas south of the ranges are tropical in climate, permitting two crops of white rice to be grown each year. Ion adsorption clays are mined by open-pit methods in the Nanling region, and form a major source of rare earth elements in the world. ^ Y. Kanazawa & M. Kamitani, J. Alloys Compounds 408-412, 1339 (2006).